Camp success depends heavily on the quality of our staff. We start looking for qualified staff as soon as camp is finished for the season. Many of our staff return year after year. 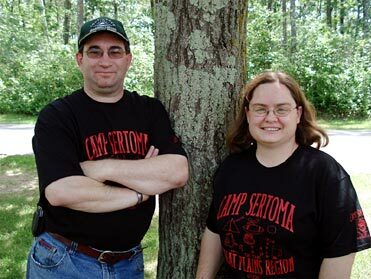 Camp Sertoma staff contribute to the vitality and reputation of camp. We know the skills and competencies that are necessary to give our campers a fulfilling experience. Our screening process gives us the answers we need to choose staff that have the right attitude and motivation. We want staff that are fully engaged, highly productive, and work together as a team sharing ideas and giving each other support. The interview process gives us an excellent means of evaluating the individuals communication skills which are imperative to our Deaf and Hard of Hearing campers. We run background checks on all staff, counselors, and volunteers. Past performance and job performance are also checked. Our number one priority at Camp Sertoma is to keep all of the campers safe and make sure they have a great time with us! Every year, in March Camp directors Jenni & Emily make a week-long trip to Washington, DC to recruit students at Gallaudet University who are interested in becoming a part of our team. The first day, they have an information booth to spread the word about Camp Sertoma, students apply for counselor positions. The next three days, are filled with interviews. Each interview tends to last about twenty minutes. 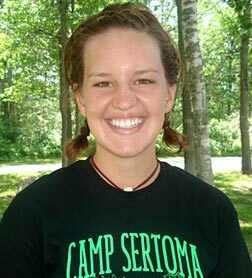 A couple of interview questions from the past, "What would you do if a camper becomes homesick? ", "If you have thirty minutes of free time before dinner, what would you do? ", "What is your worst and best trait? 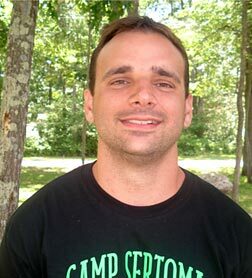 ", "What would you do if you found out or know that one of the counselors had alcohol or drugs at camp?" (We have a strict policy of no alcohol or drugs on the camp property). The pool of applicants are often very competitive and hard to choose from. 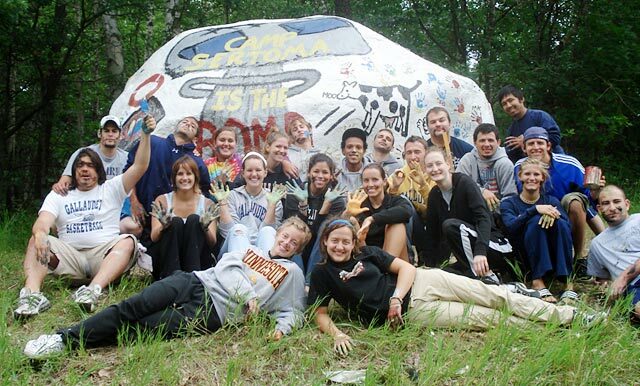 We look for applicants who have the right attitude about Camp Sertoma, who understands the need for the campers to meet others like them, without communication barriers, and have the energy to keep up with all of us at camp! The counselors come to camp to go through a week-long intense training period before the campers arrive. The counselors learn all the safety procedures required by Camp Confidence, participate in all the activities the campers will do once they arrive at camp, create new activities for the campers, and learn about child care. We have two on-site Registered Nurses, Kirk Alford & Sara Gerdts. They take vacation time from their jobs and come to volunteer at camp. They are responsible to give out medications to campers and deal with sickness and injuries if any. They also sleep at camp, so they are with us 24/7. Heather is from Indiana. She just graduated from Gallaudet University with a degree in Interpreting. She is currently working as an ASL Interpreter. She looks forward to seeing the kids come out of their shells and learn more about who they are. Paul is from the Chicago area. He was born hard-of-hearing into a Russian descended family that migrated to America in the late 1970's. He will graduate from Gallaudet University in December with a degree in Biology and Audiology. He is aiming for a Au.D in Audiology. He is very active in sports. At Gallaudet, he plays football as a linebacker. He is also on the swim team and plays Water Polo. 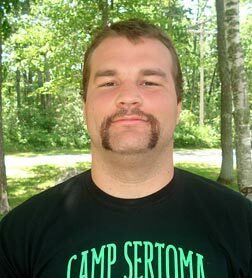 He believes that Camp Sertoma is the best camp! Ludmila was raised in Maryland. She was adopted at the age of 7 from Russia. She will be going to Taipei, to compete on the U.S. Deaf Volleyball team at the Deaflympics, at the end of this summer. She looks forward to meeting the campers and showing them a good time! Megan is from Nebraska. 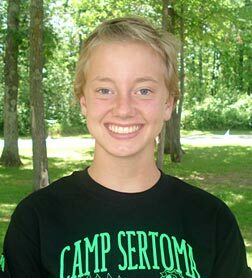 This is her second year at Camp Sertoma. She loves Doritos on her sandwiches! She looks forward to getting to know the campers and having a grand time! Mandie hails from the "Windy City", Chicago! Her passion are children. She just graduated from Gallaudet University with a B.A. degree in Elementary Education. 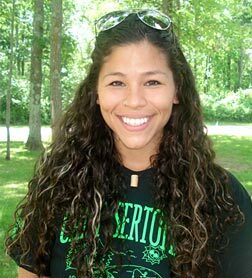 She loves water sports, books, and working with children. 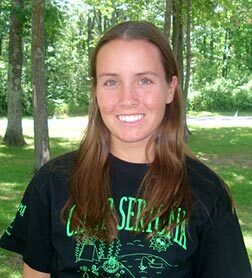 She looks forward to being with the campers and having fun! Carlisle is from Indiana, home of Indy 500 race track! She is a soon-to-be two-time Deaflympian on the Swimming team. She is looking forward to meeting all the campers and having fun! Tyler hails from Iowa, the state of corn! 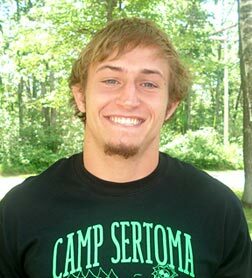 This is Tyler's fourth year as a counselor at Camp Sertoma. He loves to do all outdoor activities. Tyler just graudated from Gallaudet University with a B.A. degree in History. Marty is from New Jersey. He is a senior at Gallaudet University. He is on the Football and Track teams at Gallaudet University. 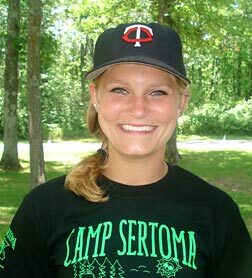 This is Marty's second year at Camp Sertoma, and first visit to Minnesota. He is really excited to play with the campers and do all the outdoor activities. Sammy was born and raised in Minnesota. She is currently a Gallaudet student. She loves to read books and playing volleyball! She is looking forward to having a lot of fun with the campers. Monica is from all over the states: Illinois, Colorado, New Mexico, New York, and is currently from California and attending Gallaudet University. 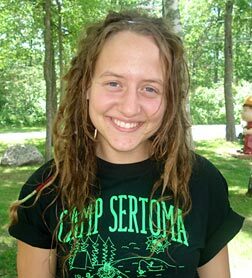 Monica has been to three different countries and is going to Kenya, Africa after Camp Sertoma under Global Reach Out Initiative program! 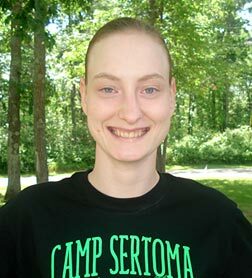 She looks forward to the fulfilling experience that Camp Sertoma provides for the lucky campers! Katie is from Minnesota. She is currently a student at Gallaudet University, majoring in Interpreting. 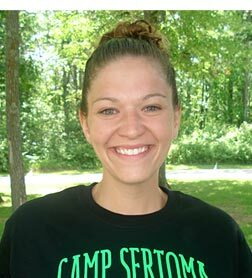 Katie learned ASL at Camp Sertoma as a lifegaurd from the campers and staff. She looks forward to seeing what else the campers have to teach her (hopefully some good prank ideas!). Everett is from North Carolina. He loves doing all outdoor activities. Everett hiked the Appalachian Trail! He loves working with children. He looks forward to have all the campers and to get to know them. Erin comes from Florida. She just completed her fourth year at Gallaudet University. She is a member of the Gallaudet Dance Company. She is really excited to be at Camp Sertoma for the second time and to see former campers and meet new campers. Chris loves being home in Austin, Texas along with the bats. He loves outdoor activities and playing basketball. His best friend is Tic Tac, his dog. He looks forward to have a blast with the kids! Bruce was born and raised in Brooklyn - New York City, NY! He is a student at Gallaudet University. Bruce loves to play all sports and attending games. 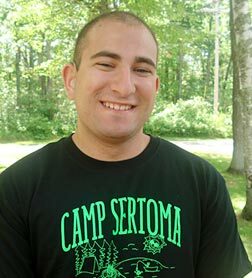 He looks forward to having fun with the kids at Camp Sertoma! Brittany is from Minnesota. 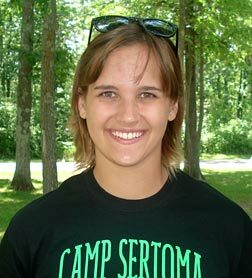 Brittany was a camper at Camp Sertoma back in 2000! 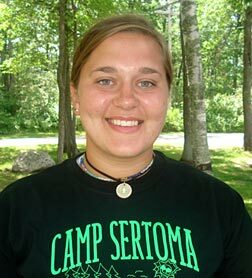 She worked at Camp Sertoma in 2007 and is now working with us again. She looks forward to learning from the campers and having fun! Bill is a Texan who bench presses 325 pounds. He loves to to play all sports. 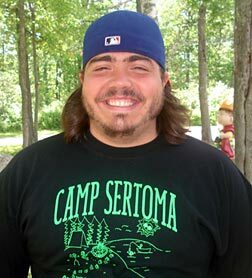 This is Bill's second year at Camp Sertoma. 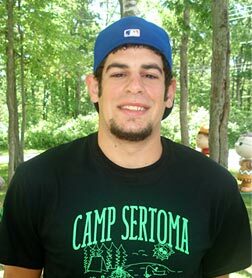 He is really excited to meet all the campers and make this a memorable summer for everybody!